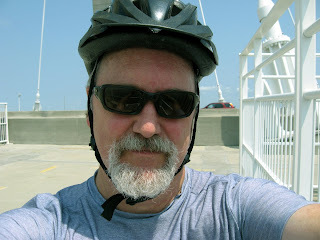 Self-portrait of yours truly at the top of the Ravenel Bridge across the Cooper River in Charleston, SC. View of the Ravenel Bridge from the docks adjacent to the SC Aquarium. 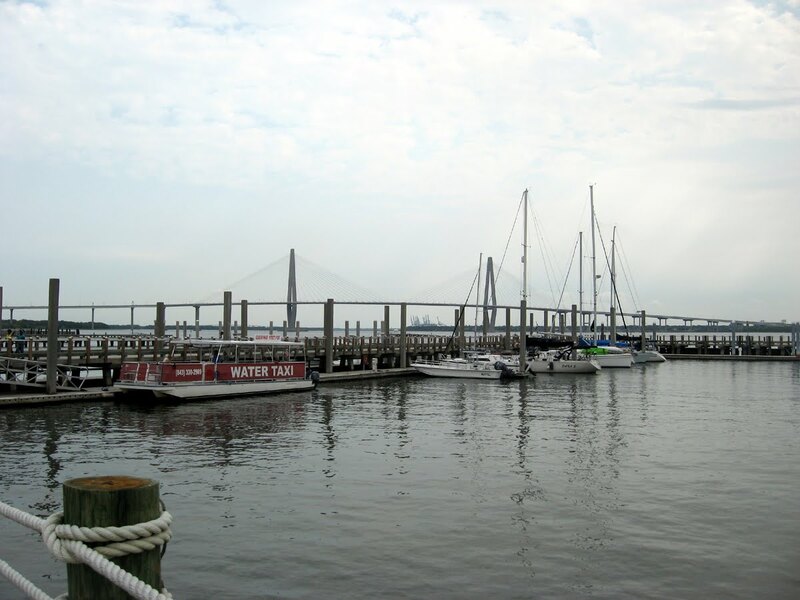 You can purchase tickets to Fort Sumter here, as well as take a water taxi to Patriots Point. I thought of taking the water taxi back from Patriots Point, but I rode back!! Yesterday I went to Charleston, SC to attend the wedding of Lauren Slocki and Captain Matthew Verdin. As I posted on Friday, Lauren is the older sister of Mathias's roommate and best friend Philip at The Kirov Academy of Ballet. Since the wedding was at 5PM, I spent the morning and early afternoon on my bike and rode to Mount Pleasant from the SC Aquarium over the Cooper River Bridge (now named the Ravenel Bridge) to Mt. Pleasant. Needless to say it was a blast and not as strenuous as I thought (maybe I am in better shape that I thought). I was smart, however, to start in Charleston and ride to Mt. Pleasant and back instead of the reverse. The uphill climb toward Mt. Pleasant to the top of the bridge is longer, and since I just started my bike run, I was pretty well rested. 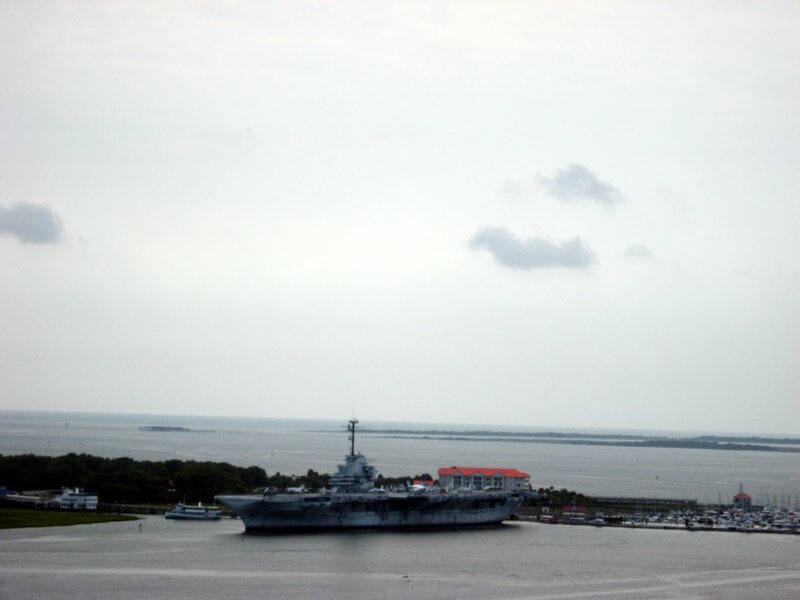 Once I crossed over the bridge I rode around Patriots Point and Mt. Pleasant Memorial Waterfront Park. I rode out on the fishing pier that lies below the bridge and went into the visitor's center. I have posted some pictures from my journey. Click on any to enlarge. 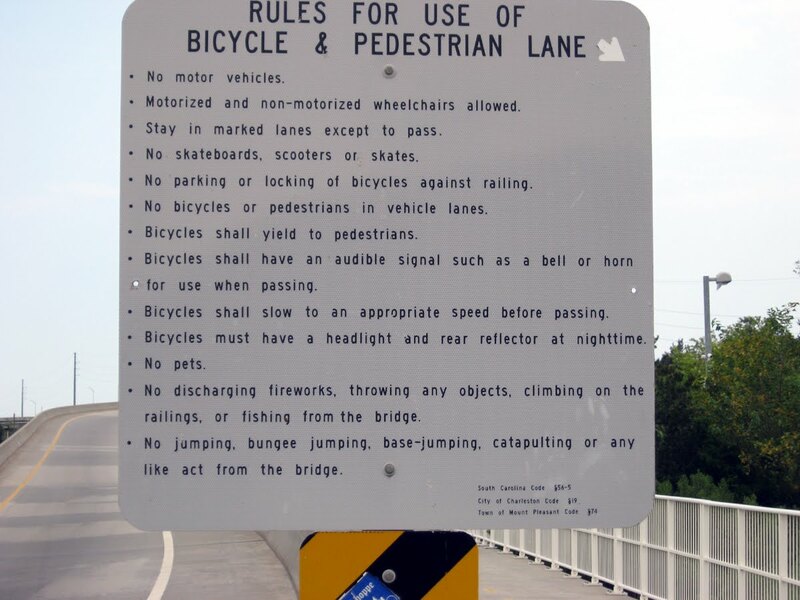 Here is the sign that greets bike riders and pedestrians before they cross the bridge. Note how wide the path is so that both walkers and bikers have their own paths. For the most part pedestrians stayed on their path, although one idiot almost stepped into my lane! 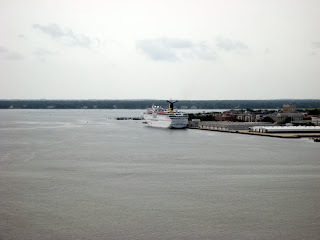 One of the many cruise ships that frequent Charleston Harbor. Their dock is just down the block from the Aquarium. 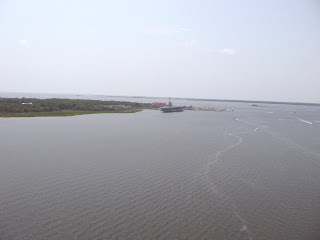 This photograph was taken from the top of the bridge. A view of Mt. Pleasant from the top of the bridge. The Battleship Yorktown is in the distance. 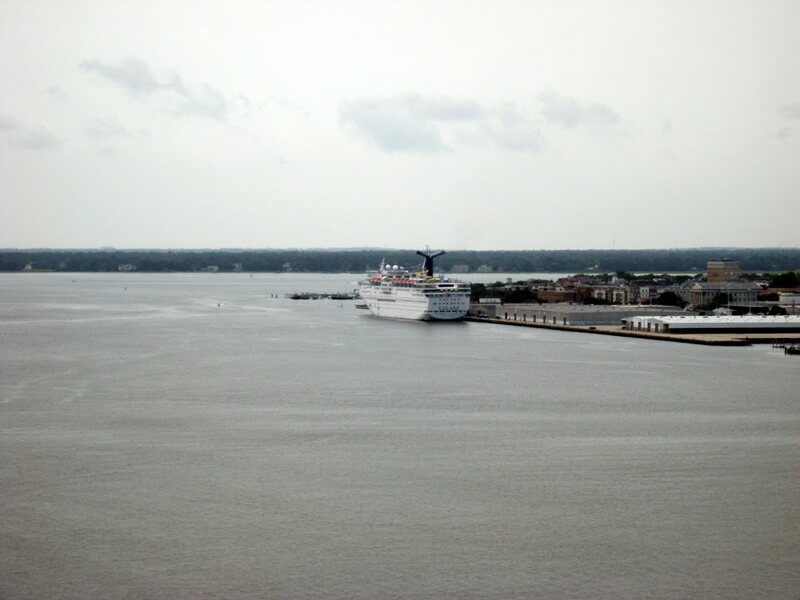 Another view of the Yorktown from the bridge. 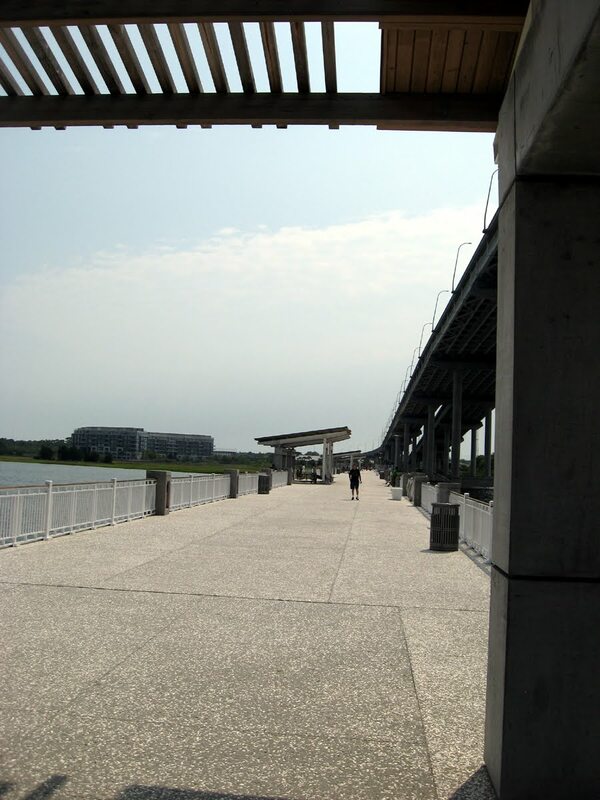 This is a nice view of the bike path on the bridge looking toward Mt. Pleasant. The public fishing pier lies to the left of the bridge support pilings. This is the view of the public fishing pier at Mt.Pleasant Memorial Waterfront Park. There were a few people fishing, but in general, it was not too busy. 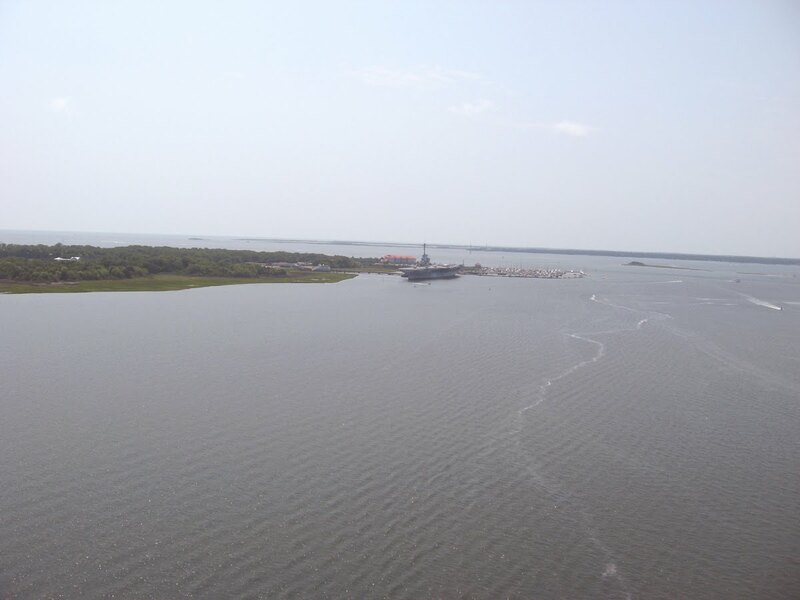 The fishing piers extends about 1/4 mile out into the Cooper River. 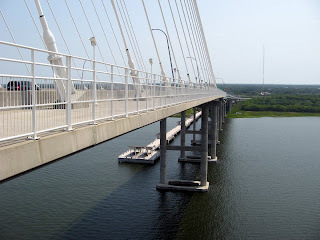 I have also posted two short videos taken from the top of the bridge. I especially like the second one, although you cannot really appreciate the scale unless you are standing where I filmed. Susan is still in Hot Springs National Park as their Artist-in-Residence for the month of August. I will fly out on a one-way ticket on the 31ST, and we will drive back over the Labor Day holiday. Saturday, August 20TH, I have the pleasure of attending a wedding in Charleston at St. Philip's Church. Lauren Slocki, who is the sister of Philip, Mathias's roommate and best friend at The Kirov Academy of Ballet, is getting married at 5PM with the reception at The Old Exchange Building. I will be leaving bright and early Saturday morning. Since Susan took the car, my mode of transportation has been our moped. Although it would be quite an adventure to take the moped to Charleston, sane minds prevail and I will be renting a car for the trip. 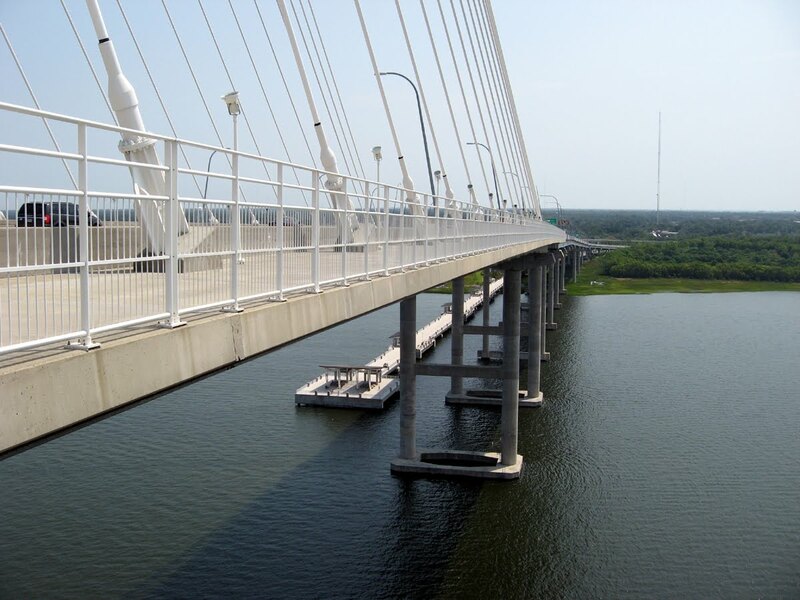 One of the things I've always wanted to do is to ride my bike across the Cooper Bridge Bridge. Thanks to a very generous upgrade from Enterprise, I will be able to take my bike in the Ford Explorer they rented to me for $19.99/day! I plan on driving to Patriot's Point and ride to my heart's content or until heat stroke sets in. I am hoping that I can take pictures from the top of the bridge. I will also take pictures at the wedding. If I survive my trip I'll post some next week.